I'm surprised I haven't gotten more requests for this record. Okay, there's a part of me that isn't that surprised - indie folk always falls into a weird category when it comes to how much people want me to cover it, but Fleet Foxes is a fascinating case in their own right. For one, I wouldn't quite define them as straightforward folk music, given how much they pulled on sunny 60s pop, alternative country, and some of the hollower Celtic elements that enriched their vocal harmonies on their first two records. And while the impressionistic lyrics could make for a complicated listening experience to decode, a lot of people were just content to let the words and richly organic instrumentation wash over them, from a star-making self-titled debut to the darker yet no less compelling Helplessness Blues a few years later. And yet there's a part of me that feels like Fleet Foxes might have been forgotten a bit - between the years between records in an increasingly quick hype cycle, even in the indie scene, to say nothing of the rise of one-time drummer for the group Josh Tillman to dominance under the moniker Father John Misty, it might have been easy for Fleet Foxes to get forgotten, especially given as their very earnest and heartfelt brand of folk was later copied ad nauseum in the early 2010s by far less complex or interesting acts. And yet six years after Helplessness Blues, Fleet Foxes are back after an extended hiatus, minus Tillman and on a new label with their longest record to date. And if only to soak in those harmonies, I really wanted to check this out, so what did I find on Crack Up? Huh... okay, I've seen a few different responses to this record, for which there is a common consensus that this is a more... difficult record to decode and process. 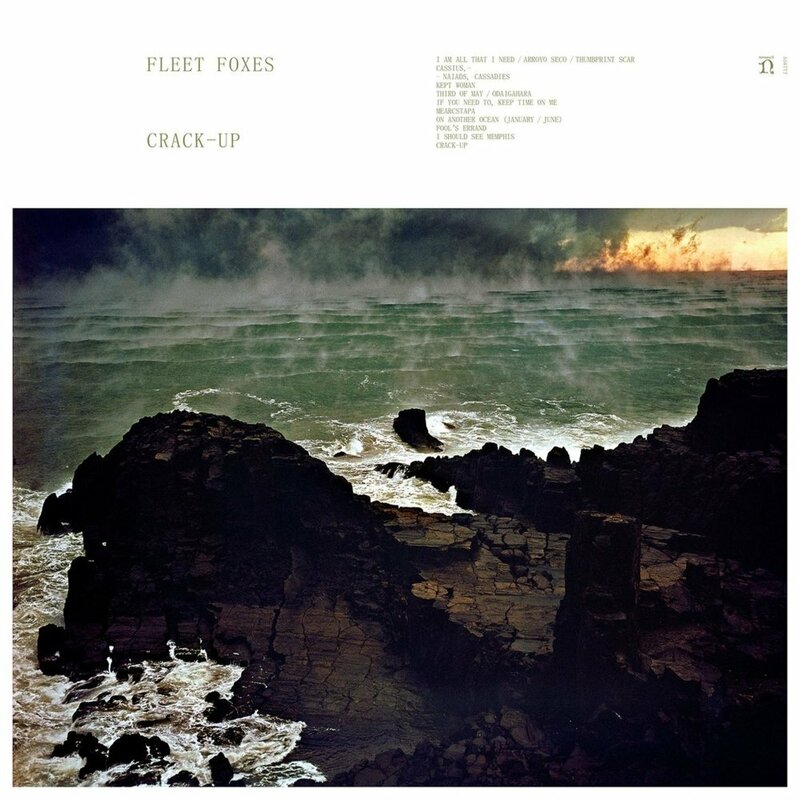 And these responses split into two categories: those that'll praise it regardless and highlight how the complexity is part of the point as a more progressive evolution of Fleet Foxes, and those who'll highlight how that progressive angle doesn't exactly translate into stronger, more insightful songs or progressions that have the same punch of Fleet Foxes' original work. And for me... look, there's a grain of truth to both perspectives, because while I definitely don't think this record is bad by any stretch, it does pale in comparison to Helplessness Blues or especially the self-titled record, and I'd make the argument that those progressive influences don't elevate the album enough to make up for surrendering strong hooks and more cohesive songwriting. Now I'm fully aware that is a loaded statement and I do want to stress that at least on the surface, Fleet Foxes do maintain many of the tones and sounds that made them such an easy group to like. The vocal harmonies led by Robin Pecknold are as earnest and layered as always, and while I can hear a slight easing of the more obvious alternative country influences, the instrumentation does feel more lush and expansive in the strings and horns, not quite swiveling into baroque pop but definitely picking up a little more pomp and weight. What it does pick up from baroque pop is a certain sense of indulgence, because you can definitely make the argument that are experiments on this record that have nowhere close to the impact they think they do. Take the opener 'I Am All That I Need/ Arroyo Seco /Thumbprint Scar', which opens with a very sparse, poorly tuned guitar line and some borderline clumsy vocal harmonies - and yes, thankfully it breaks into a strings-accented acoustic groove with subtle swells of deeper melody that all run through, but I can't be the only one who finds it jarring how often the song pivots back to barebones acoustics mid-groove, even if the main melodic motif continues and evolves. Or take 'Mearcstapa' - I'm not really wild about the minor melody that touches against the horns, at least until we get to the electric guitar tone that fills in for the hook, but then we get the outro... and yes, I get that the melodies are layered in a round, but normally when you have a round you have elements that compliment or harmonize with each other in each movement, and this doesn't really get there! Or take 'Third of May/Odaighara', a song intended to represent the tonal shifts and melodies that came over Fleet Foxes' history and hiatus, and not only is it very telling how the music representing their older work on the first half sounds phenomenal, but whenever Pecknold intentionally adds slower moments to shift the mood or that drawn-out, watery, droning endpiece to capture a uncertain future, they're elements that make sense artistically but leads to a composition that just doesn't hold the same power and an ending that loses all momentum for the last three minutes - which isn't a good thing on a nine minute song! And that's before you get songs like 'I Should See Memphis' where the ending doesn't really go anywhere, or the title track that piles in the horns for a grand finish... and then you end with forty five seconds of somebody running through a hall with little real payoff? Now that's not saying there aren't songs that have a more conventional flow: the deeper swell in the low end on the verses of 'Cassius', even if I don't think the melody on the hook quite pays off the build-up, at least not until the violin cuts through the bridge; 'Naiads, Cassadies' has a more refined gentle sway especially with the main guitar line and piano on the bridge. And it's clear songs like 'Kept Woman' and 'If You Need Me, Keep Time On Me' or even 'Fool's Errand' are calling back to a more established 60s folk melodic structure that I really like. And unlike most pieces, I think the transition between grooves in 'On Another Ocean (January/June)' is actually pretty well done, even if again it never really hits a defined climax moment despite its buildup. But when this record abandons that for sudden slowdown moments or whiplash transitions... look I've heard it described as calling back to a jazz approach to composition, but good jazz plays with that tension to eventually find release, and considering this record really doesn't build the momentum to dramatic climax, I can't help but feel underwhelmed by Pecknold dipping into a very flat, low monotone that is nowhere close to being as expressive - and that's before you get 'I Should See Memphis' which is that vocal tone used for nearly the entire song. But fine, that can normally be excused if there's a certain poetry and flow to the writing, and I'll be the first to say that I do like Pecknold's more literate and layered lyrics - there's always been a richness to the poetry that reads really well, even if you can't quite grasp the message on the first run through. Unfortunately, when you do decode what is being said on this record... it may have been an issue on previous Fleet Foxes albums, but with the instrumentation and harmonies that much more scattered, the lyrics do come into sharper focus and I cannot say I'm all that impressed. If you're looking for a broad overarching theme it circles back to expectations - you know, that it's not all that it's cracked up to be - and from there we get a series of very loose pictures around it, from the complicated relationship Pecknold has with his bandmates during the last tour and hiatus to some political statements that fall kind of flat for me. In the former case, I can at least appreciate that Pecknold acknowledges that he set his own expectations, blinding himself to other possibilities and more often than not only having himself to blame for creating distance. Okay, sure, when he owns that responsibility, that can add to the melancholy, even on only thematically connected songs like 'Kept Woman', or on 'I Should See Memphis', where each couplet is subverted by the next - but that problem that song has is in equalizing the choices made out of expectations, the path taken and the path not. And that's not quite the case when you explicitly draw parallels to the 2016 election, because you can be damn certain they were not the same choice! And yet there's an odd detachment from choices that affect others that's all over this record, where you get a certain brand of underwritten armchair privilege that bothers me more because Pecknold really could have thought this through. Take 'Naiads, Cassadies', a song very plainly about society imposing strictures on women, but how is the final verse anything but more projection - or take 'Cassius -', a song literally calling out how the system has betrayed black people in America where he observes protests as a sympathetic observer, and I can't help but feel it says a lot more that he chose not to involve himself if only to stand as another voice against systemic injustices - so yes, you are so tamed, but that's because you allowed yourself to be. And when you juxtapose the choices you regret that you made because they have direct consequences, versus the choices you don't make because you think they don't ultimately matter when they actually do in the bigger picture, and they're framed on the same level without the self-awareness in the latter case, you have a major case of thematic dissonance and it really does a number on this record. But it doesn't really surprise me, mostly because the record feels myopic, without that additional step to see the bigger picture. And that can work when you have intimate framing but this record rarely if ever gets that close or raw, instead opting for more indulgent, grandiose production and arrangements that don't really hit that dramatic payoff. In short, the more I listened to this record the less I liked it, leading to a light 6/10 from me and nothing more than a tentative recommendation, and while I'll admit the writing is tasteful and the harmonies can be beautiful and the style of it all can resonate, go even a little deeper and you'll find a record that gets frustrating in a hurry. And considering it took six years to get to this... yeah, that's a disappointment.